Welcome to this week’s quilt jigsaw puzzle from Quilt Alliance! The beautiful quilts in the puzzles have all been contestants or quilt donations in current or past Quilt Alliance contests and auctions. Be sure to sign up for our blog notifications, so that you don’t miss any of the upcoming puzzles. This key fundraiser supports our mission of documenting, preserving and sharing the history of quilts and their makers, and is an important opportunity to showcase and record the work of quilters in the U.S. and all over the world. You can still bid on this and other 2017 auction quilts through December 4 at 9pm EST here www.QuiltAllanceAuction.org. 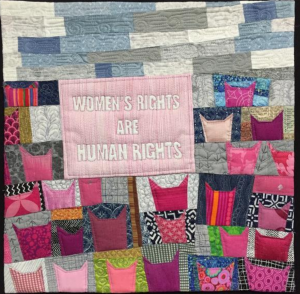 This week’s puzzle is a photo of the label on the back of a quilt entitled Sisterhood of the Pussyhats made by artist Betsy Vinegrad of Short Hills, New Jersey for the 2017 Quilt Alliance “Voices” contest and auction. The piece is made from fabrics designed by and/or purchased from women. Wool and cotton/polyester batting. Polyester and cotton thread. Pieced, quilted and embroidered on a domestic sewing machine. The Pussyhat Project, conceived of by Krista Suh and Jayna Zweiman, was launched to make pink hats as a unifying symbol at the 2017 Women’s March. Gatherings took place all over the country to make pussyhats. For centuries, knitting and quilting bees have been safe places for support, sharing of ideas and even political activism. Made at a weekend retreat, inspiration came from many women including fellow quilters, fabric designers, knitters, crocheters and marchers. We rely on the generous support of donors and members like you to sustain our projects. If you support our mission of documenting, preserving, and sharing the stories of quilts and quiltmakers, join us by becoming a member or renewing your membership, making a donation, or learning how your business or corporation can become a supporter of the Quilt Alliance. Hi, Camille! I just created a post on the Quilt Alliance Facebook page: https://www.facebook.com/quiltalliance/. You could just share this post, or you could create a post and link it to the puzzle directly: https://www.jigsawplanet.com/?rc=play&pid=1b4d84f3f474. Thanks! Hi Bonnie, sorry we missed your comment before! I think you will need to contact American Patchwork & Quilting Magazine at http://www.allpeoplequilt.com/magazines-more/american-patchwork-and-quilting to inquire about patterns. Best of luck.